A self-directed IRA (SDIRA) allows an investor to acquire real estate as an asset while keeping the tax benefits of a traditional IRA. SDIRAs make real estate investing an option for investors who want to take advantage of real estate’s return potential, its ability to hedge against inflation and diversify the investment portfolio. Additionally, with the tax advantages of an SDIRA, you might find yourself deferring or otherwise not paying tax on your investments. With a fully managed property purchased through HomeUnion®, you can reap all the benefits provided by single family residential property investing without engaging in the cumbersome managerial aspects that make real estate intimidating for so many investors. 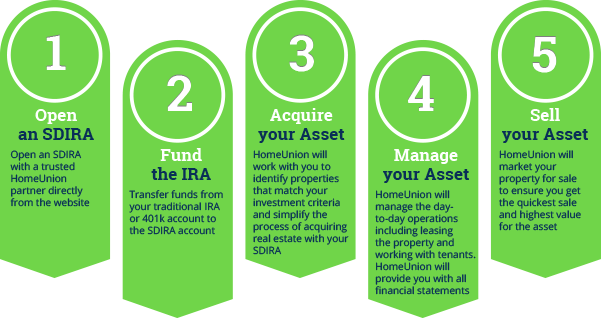 While real estate investing using IRAs used to be an undertaking for most self-directed and hands-on investors, HomeUnion® makes it a viable option for anyone with the appropriate means. The term “self-directed” simply means that you, as the individual account owner, have complete control over selecting and directing your own individual retirement investments. The IRS requires SDIRAs have a custodian to ensure rules are being followed. SDIRA custodians are equipped to handle the increased complexity of documentation required for transactions involving alternative investments (such as real estate), as opposed to traditional IRA custodians that typically only offer stocks, bonds and mutual funds as investments. How do I fund my SDIRA account? IRA-to-IRA Transfer of funds: Complete a transfer form requesting the transfer of funds directly from your original IRA custodian to your new SDIRA account. Include a copy of your most recent IRA statement. IRA Rollover: Request distribution paperwork from your prior 401k administrator. Complete the forms and return to the administrator who will withdraw the funds and transfer directly into your SDIRA account. Contributions: Make a cash contribution into the SDIRA account online, via bank wire or by check. When purchasing a property, how do I pay? You submit a buy direction form to your SDIRA custodian who will then send the funds from your account to the title company, attorney, or escrow agent handling the transaction. When I purchase a rental property with my SDIRA does the rental income go back into my SDIRA? Yes. All income from an SDIRA owned property must return to your IRA. This ensures that you retain the tax-deferred or tax-free status of the account. How do I get rental income? Rental payments are collected by HomeUnion® and deposited directly into your SDIRA account. How do I pay for any rehab on an investment property? Your IRA must pay all expenses associated with a property that it owns, including rehab. Investment properties purchased using an SDIRA cannot benefit from sweat equity either, so you must hire a third party vendor to complete all repairs. Can I finance an investment property when using an SDIRA? Yes, you can finance an investment property as long as it falls within certain guidelines. IRS regulations require all loans to SDIRA to be non-recourse loans. The lender will be lending solely on the qualifications of the asset, therefore the lender will not check your personal credit or income, and the loan will be in the name of the IRA. How do I sell a property owned by my IRA? When you’re ready to sell a property that’s owned by your SDIRA, the SDIRA custodian will sign all the documents once you have approved them. Once the property has been sold, all funds from the sale are deposited into your IRA. Will I have to pay any taxes on my earnings? If no loan was used the earnings are tax-free like earnings from any other IRA investment. If financing was used, you may be subject to Unrelated Business Income Tax (UBIT) on the portion of earnings attributed to borrowed money. HomeUnion® does not provide investment advisory, tax, legal or financial services, and recommends that you consult a licensed real estate, tax, legal, accounting or investment professional to perform an independent analysis before making decisions regarding the purchase or sale of real estate.